Black Friday, the day after Thanksgiving, is one of the largest sales days of the year. Stores begin their holiday sales, and most offer sales specific to that day only, sometimes for a limited amount of hours during the day. This Black Friday, Nov. 23 (N23), the Occupy movement is coming together to protest the unethical business practices of large corporations, their marketing tactics and the consumers who buy into the hype. The movement is in support of small, local businesses and the self-employed. From the Occupy Black Friday Facebook page. The face Occupy Black Friday is putting to the name of corporate greed and unethical business practices is primarily Walmart, a corporation known for its unfair labor practices and accused with being a driving force of the downfall of small businesses. Occupy is also pushing the message of the point of Thanksgiving, to give thanks for what we have, and contrasting it with the point of Black Friday, consumerism. Walmart workers have developed a protest group called “Our Walmart” to speak out about Walmart’s labor and business practices. Occupy Black Friday stands in solidarity with these workers, planning a Black Friday Boycott of Walmart. There are various groups in cities across the nation organizing protests and actions for N23. InterOccupy and Occupy the Boycott have an event page of their own on Facebook. Occupy Black Friday has its own page. This article highlights the skepticism the movement has faced in its efforts to Occupy Black Friday last year. This skepticism definitely still exists, and it is a huge undertaking to attempt to break Americans from the cycle of consumerism. Advertising is strong, as are cultural traditions and norms of greed around the holiday season. However, if Occupy organizes this correctly, connects with the heads and hearts of consumers in the 99% effectively and makes a big enough presence across the nation, it just might be able to shake up this gigantic corporation and the unending cycle of consumerism, which would be a great feat for the movement. “Sandy’s occupying Wall Street now,” is a comment I noticed on Facebook the other day. Maybe there is some truth to that statment, amidst the dark humor, but there are also goodhearted people of Occupy Wall Street still making a presence and putting forth effort to aid victims of the hurricane. This mission, called Occupy Sandy Relief, is composed of members of Occupy Wall Street, 350.org, recovers.org and interoccupy.net and is dedicated to neighborhood resource distribution and aid implementation for those affected by Hurricane Sandy. 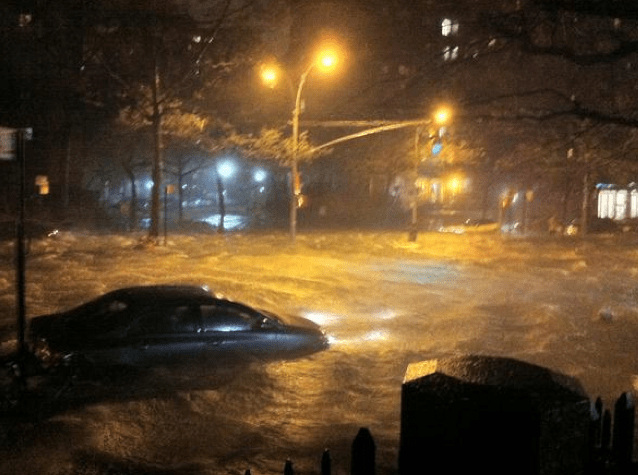 Lower East Side during Hurricane Sandy. Picture from Twitter. So far, the coalition has established a social media presence, a mobile update system and collected and distributed supplies to various areas of New York City, with distribution and collection hubs in many neighborhoods. Occupy Sandy still needs blankets, candles, flashlights, lights, water, food, batteries, diapers and wipes, gloves and masks, rubber boots, shovels, cleaning supplies and bleach, trash bags, serving dishes and utensils, heaters and winter clothing, not to mention volunteers. Some people have offered up their homes as charging stations for those who have lost electricity and need to charge their cell phones. Seeing members of the Occupy movement unite together like this for the greater good of the public is amazing. In doing so, they are hopefully gaining the respect and support of members of the 99% who would not normally take notice or give credit to Occupy. Occupy Sandy is a very focused coalition, and the work it is doing is thorough and effective. Its diplomacy is gaining media attention and helping those who are truly in need. While New York City may be more focused on rebuilidng itself and giving shelter and medical aid to its citizens in need, sometimes supplies fall by the wayside. Organizations and efforts like these make up for that need and give citizens hope. One year after its organization in solidarity with the Occupy Wall Street movement, Occupy Chicago is not quite as ostentatious, organized or obeyed by the 99 percent as it once was. The movement has to be commended for the work it has done to unite citizens against corporate greed, inequality and austerity. Though its goals are still as pure, the ways it has sought to reach them during the past year could use some revision. Occupy Chicago now considers itself an “umbrella organization” for other movements with similar motives to promote positive social change. It has its heart in the right place by choosing to support the activism of others, but it is losing its own focus. The specificity of its goals have fallen by the wayside. The direction and direct action the movement once had has disintegrated. The multitude of committees that once were actively meeting and working together to further develop the movement’s goals seem to have lost member commitment. Maybe it was the allure of something different, edgy and slightly dangerous that drew so many members of the 99 percent into the movement upon its formation. Maybe it was press coverage, the peer pressure or a true shared rage at inequality. The insincere among the 99 percent, of course, would not have braved the cold weather to see the movement through last winter. The press was tired of the same stories. The most involved were tired of getting arrested. The only elements of Occupy Chicago that haven’t seemed to change are a few ultra-dedicated members and the ever-present Chicago Police Department following them to every rally, speak-out and event. Most people I’ve spoken with about the movement agree with its principles, its attempts to bring equality to the middle and lower classes, its useage of free speech. Where are these people at General Assemblies on Wednesday nights? When I look out the window during my Wednesday night class, only seven or eight people are visible at Congress and Michigan. Could it be that, like me, these people are just too busy to get involved? Could it be that they’d rather let others do the work? Could it be that they’re not passionate enough? Or could it be that the blame lies within Occupy itself? The entire Occupy movement needs to rebuild itself from the ground up. It needs to grab the 99 percent by their throat and make them open their eyes to the injustice it organizes against. It needs to actually organize. Supporting other movements with similar goals is great, but these efforts do not necessarily leave time for Occupy to develop its own plans of action. Occupy Chicago’s virtual presence is phenomenal. Its social media committee certainly knows how to relate to the public. Now, the movement needs to figure out how to bring this interaction from the Internet into the real world. One-year-anniversary rallies and celebrations are great, but Occupy Chicago needs to take a look at what it really has to celebrate at this point in time. There is way too much apathy by outsiders surrounding the movement today, and the movement’s dedication to an ultra-democratic, nearly anarchical structure is most of the problem. When nearly everyone has a say, nothing gets done. Sitting in on a committee meeting, this structure is evident. Differences of opinion are a normal thing, but it appears no one knows how to solve them efficiently. Somebody or somebodies need to emerge as a leader. The movement needs guidance, a commander in chief. There is a way for Occupy Chicago to garner press attention without members getting arrested; there is a way for members to not get arrested without completely sitting in the corner and having quiet discussions. A happy medium will drive the Occupy movement forward. It just needs to find the structure, the support and the right plans of action to find it. Tomorrow, October 15, 2012, marks the one-year anniversary of a day thousands of Occupiers in Chicago marched from Jackson and LaSalle to Congress and Michigan where they attempted to set up camp to demonstrate their committment to their mission and to the Occupy movement. As a result of the attempt, hundreds of demonstrators were arrested for staying in Grant Park after its closing hour of 11 p.m.
Chicago police in Grant Park. October 15, 2011. Photo by populacity on Flickr. Coincidentally, September 27, nearly a year after the incident, it was ruled that the arrests were unconstitutional and violated protestors’ First and Fourteenth Amendment rights. Occupy Chicago considered the dropped charges a major victory. To celebrate this anniversary and the dropped charges, Occupy Chicago will have a speak out and march tomorrow at 6 p.m. from Jackson and LaSalle to Congress and Michigan, once again. At 7 p.m., the Overpass Light Brigade will assist Occupiers in raising light banners to celebrate “eviction resistance and home reclamation.” From 8-10 p.m., a free speech fest will be held with live music at the Bowman Horse statue. This event is extremely important to the future of Occupy Chicago. Depending on how it is executed, it can potentially give the movement some much needed press coverage and rejuvenation. Often, the “sexier” stories for media include violence, arrests and the most drama. O15 needs to fit somewhere in between too safe and too risky. The message of Occupy Chicago doesn’t include provoking the police for the sake of provocation or violence, in any circumstance. It also doesn’t include just sitting around talking about how change can happen. It calls for peaceful, meaningful action. The objective of Occupy Chicago was never to get as much press coverage as possible, but at the point the movement is at right now, teetering between reignition and flying off the radar, it needs to be as visible as possible. Its target potential activists, members of the 99%, are often hard working individuals who may feel strongly about the movment’s message but who are deterred by the possibility of being dragged into radical action in the movement or by the time commitment. In order to fully organize, the movement needs to host more large-scale evening events that provoke people to think and respond by wanting to get involved. If you are planning on protesting tomorrow, remember your rights, and be safe. P.S. Occupy Chicago revamped its website. Could this mean it’s time for change? How can the average person get involved with Occupy? After seeing what Occupy does, why it exists and where it’s at as a movement right now, if your interest is peaked, there are many different ways to get involved that can require as much or as little effort as you choose. Most cities’ movements have various meetings at different times of the week, and these local movements are often subdivided into even smaller neighborhood, college, or organizational movements. As an example, Occupy Chicago has general assembly meetings every Wednesday at 7 p.m. at Congress and Michigan. These meetings are in open, public space and are generally quick and small in numbers of attendance. However, newcomers should not be deterred. Occupiers appreciate any genuine help and interest they can get from any members of the 99%. At these meetings, talking is not necessary if you do not have any ideas to share. You can simply listen to general announcements and soap boxes to get a feel for what is going on within the movement. More information on general assembly procedure can be found here. An example of a general assembly from last year. Additionally, Occupy Chicago holds committee meetings increasingly during weekdays. The Direct Action Committee is meeting tomorrow at 8 p.m. at Congress and Michigan (to discuss O15, which I will blog about next, yay!). This committee’s purpose is to formulate specific plans for the movement on days of organized protest and moving forward, in general. You don’t have to be an established committee member to attend the meeting. In fact, because of members’ fluctuating schedules and other factors, committee members change quite often and are not thoroughly kept track of. On Saturdays, Occupy Chicago holds general assemblies in different neighborhoods around Chicago. This allows people who would not normally be able to attend Wednesday assemblies in the Loop to have a chance to participate in the movement. Plus, if your neighborhood has its own movement (Occupy Rogers Park, Occupy el Barrio, etc. ), those organizations have their own meeting times and places. If physical meetings aren’t possible for you, it is very possible to be active within the Occupy movement virtually through social networks like Facebook and Twitter. This allows for a more national and global outreach, as well. Is there a connection between Anonymous and Occupy? So, now that we already know what the Occupy movement is and what its motives are, we can look into more about what it really does and who it really works with. Occupy has become an umbrella organization for protests with common goals. It has decentralized and works through many different groups and locations. Is one of these groups Anonymous? Well, maybe. Sounds intimidating, right? It demands respect and promises consequences if it’s not given. However, Anonymous hasn’t quite lived up to its slogan, recently. Many of its projects have fallen through, some of its members have been arrested, and though projects are always in the works, the organization seems to be more talk than action. However, that’s not to say that all hope is lost. 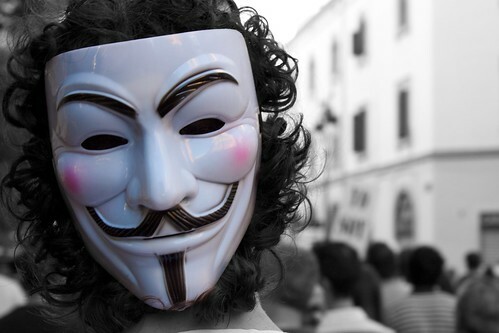 Anonymous is to be respected for organizing and attempting to do what most of us do not have the skill or bravery to do. But are they involved with Occupy? They certainly support its mission, and Anonymous members have been known to attend rallies and general assemblies. They use a Guy Fawkes mask as one of their mascots, though the masks have been adopted by Occupy and most other movements, as well. Photo by anroir on Flickr. Anonymous does have organization, and an explicit purpose. Now, implementation is key. September 17, 2011 was the day the Occupy Wall Street (OWS) movement formed in defiance of the inequality, greed and corruption demonstrated by governments and corporations. The Occupy movement as a whole also officially began on this day, with many other cities starting branches of Occupy in solidarity with OWS in New York. Citizens across the country and world have experienced arrest, injury and even death in the name of the movement. Hundreds of thousands of protestors across the country and world have identified and continue to identify with Occupy’s purposes. So why is September 17, 2012 such a big deal? It marks the one-year anniversary of the movement, and OWS and its satellites across the country are celebrating and pressing the message of anti-austerity throughout the day, tomorrow. For my local readers, Occupy Chicago is rallying, marching and communicating their message of “resistance and hope” tomorrow night, beginning at 5:30 p.m. at Congress and Michigan. On the east coast, OWS is having many different events throughout the weekend and day tomorrow to raise awareness and celebrate. They are also posting live news updates of their efforts on their Twitter, @OccupyWallSt. So why should you care and get involved? The fact that this movement is still operating with such organization and power behind it one year after its commencement proves that it is not to be taken lightly or ignored. All of the 99% needs to come together to combat inequality. Onlookers and citizens who view the movement as radical need to educate themselves and investigate what the movement is all about and how it operates. Apathy toward Occupy’s motives and efforts is just as harmful to the nation as the greed of the 1%. In Occupy, we have a chance to rise up against the inequality and injustice of poverty and the declining quality of life for the lower and middle classes. We do not have to settle for melancholy lives of being taken for granted and for ignorant by politicians and big businesses. We are the foundation of everything the 1% knows, and we do not have to submit to these lives of degradation and hopelessness. Go to your local Occupy events, give the movement a chance and promote true change. If the movement grows in numbers, it also grows in strength. The passionate leaders among us cannot carry all of our weight. We must unite to be sure the movement continues until our voices are heard and recognized.